سفیدروح, مصطفی, خزاعیان, ابوالقاسم, پل, محمد حسین, لیاقت, غلامحسین, یوسفی, حسین. (1397). بررسی مقاومت به ضربه تخته لایه ساخته شده با چسب تقویت شده با نانو الیاف سلولز. مجله صنایع چوب و کاغذ ایران, 9(2), 263-275. مصطفی سفیدروح; ابوالقاسم خزاعیان; محمد حسین پل; غلامحسین لیاقت; حسین یوسفی. "بررسی مقاومت به ضربه تخته لایه ساخته شده با چسب تقویت شده با نانو الیاف سلولز". مجله صنایع چوب و کاغذ ایران, 9, 2, 1397, 263-275. سفیدروح, مصطفی, خزاعیان, ابوالقاسم, پل, محمد حسین, لیاقت, غلامحسین, یوسفی, حسین. (1397). 'بررسی مقاومت به ضربه تخته لایه ساخته شده با چسب تقویت شده با نانو الیاف سلولز', مجله صنایع چوب و کاغذ ایران, 9(2), pp. 263-275. سفیدروح, مصطفی, خزاعیان, ابوالقاسم, پل, محمد حسین, لیاقت, غلامحسین, یوسفی, حسین. بررسی مقاومت به ضربه تخته لایه ساخته شده با چسب تقویت شده با نانو الیاف سلولز. مجله صنایع چوب و کاغذ ایران, 1397; 9(2): 263-275. Doosthoseini, K., 2008. Wood Composite Materials, Manufacturing, Applications, Vol 1, Tehran University Press. Iran. 647 pp. Veigel, S., Müller, U., Keekes, J., Oberstriebnig, M. and Gindl-Altmutter, W., 2011. Cellulose nanofibrils as filler for adhesives: effect on specific fracture energy of solid wood-adhesive bonds. Cellulose, 18:1227-1237. Lie, H., Pizzi, G. and Celzard, A., 2008. Influence of nanoclay on urea-formaldehyde resins for wood Adhesives and its model. Journal of applied polymer science, 109:2442–2451. Qiaojia, L., Guidi, Y., Jinghong, L. and Jiuping, R., 2006. Property of nano-SiO2 / urea formaldehyde resin. Journal of Fujian Agriculture and Forestry, 2: 230-237. Model, O. and Sefidrouh, M., 2015. Improving adhesive characteristics with Nano-Reinforcement: A review. Journal of Polymerization, 5 (4): 43-53. Xu, Sh., Girouard, N., Schueneman, G., Shofner, M.L. and Meredith, J.C., 2013. Mechanical and thermal properties of waterborne epoxy composites containing cellulose nanocrystals. Polymer Journal, 54 (24) 6589- 6598. Lopez-Suevos, F., Eyholzer, C., Bordeanu, N.and Richter, K., 2010. DMA analysis and wood bonding of PVAc latex reinforced with cellulose nanofibrils. Cellulose, 17 (2) 387-398. Barzali, S., Jamalirad, L., Faraji, F. and Hedjazi, S., 2015. Using cellulose nanofiber as filler and reinforcing agent of urea formaldehyde. 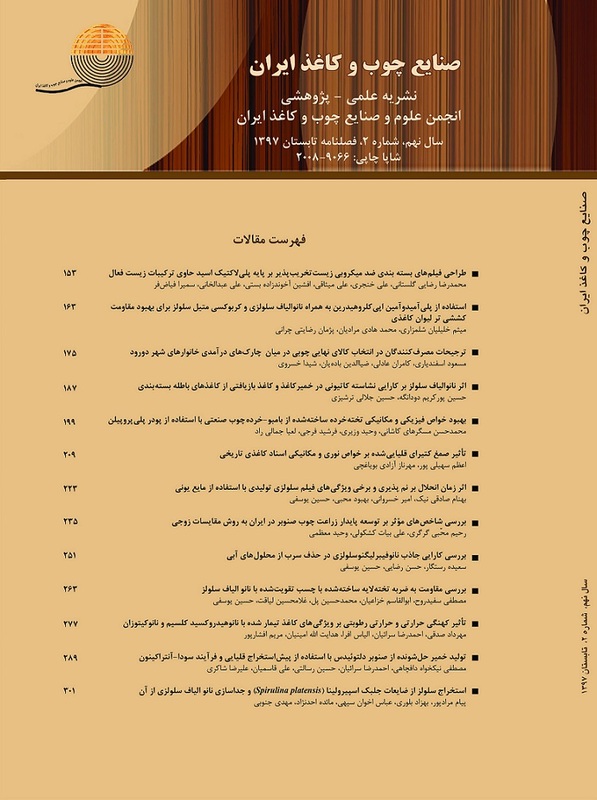 Iranian Journal of Wood and Paper Industries. 6 (2): 227-237. (In Persian). Zike, S.and Kalnins, K., 2011. Enhanced Impact Absorption Properties of Plywood. In Civil Engineering. International Scientific Conference. Proceedings (Latvia). Latvia University of Agriculture. Jandial, R., Reichwage, B., Levy, M., Duenas, V. and Sturdivan, L., 2008. Ballistics for the neurosurgeon. Neurosurgery, 62: 472-480. Dashti, H., Salehpur, Sh., Taghiyari, H.R., Akbarifar, F. and Heshmati, S., 2012. The effect of nano clay on the mass transfer properties of plywood. Digest journal of nanomaterial and biostructures, 7(3):853–860. Dong, H.K. and Arthur, J., 2004. Enhanced composite board curing and performance via nano clays (Conference). Paper summit Spring Technical and International Environmental Conference. Atlanta, GA, United States, 5: 387-391. Hong, L., Guanben, D., Pizzi, A.and Celzard, A., 2008. Influence of nanoclay on urea-formaldehyde resins for wood adhesives and its model. Journal of Applied Polymer Science, 109(4): 2442-245. Jinshu, S., Jianzhang, L., Wenrui, Z. and Derong, Z., 2007. Improvement of wood properties by urea Formaldehyde resin and nano-SiO2. Frontiers of Forestry, 2(1): 104-109. Ziaei-tabari, H., Khademieslam. H., Bazyar, B.and Hemmasi, A.H., 2016. Investigation on the possibility of making a nano composite containing pebax and nanocellulose. Iranian Journal of Wood and Paper Science Research. 31(1): 92-104. (In Persian).